Amazing health and lifestyle benefits, often experienced from the first day, are a result of improved nutrition, because Hemp Hearts™ are the Most Concentrated and Best Balanced Source of Proteins, Essential Fats and Vitamins in Nature. 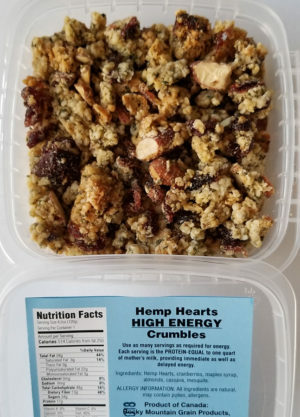 The Original Hemp HEARTS™, Hemp Hearts (reduced fat) FLAKES, Hemp Hearts (reduced fat) Protein POWDER, Clear Hemp OIL, Green Hemp Oil, Dip Dressing Sauce, More than a Square Meal BARS (hemp chocolate bars), Square Meal Dessert, Little Man’s Square Meal (hemp-hearts cookies). (shelled hemp seeds) are 100% pure, natural, raw shelled hemp seed – the best single food source of protein, essential fats, vitamins and enzymes on the planet. Nature has provided the essential nutrients for restoring and maintaining optimal health in a power-packed seed that is gluten, cholesterol and sugar free. 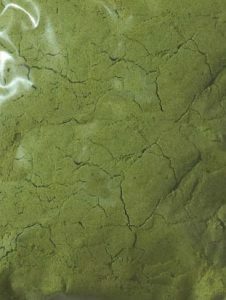 Unlike competitors’ Hemp Protein Powders, our product is not Made With Sandy Textured Ground Shell Material. Wonderful with soups, dressings, drinks and high moisture foods.Dissolves almost entirely in hot water. With much less fat than Hemp Hearts™, it does not lubricate the digestive system too much, so it can be used with starches and processed foods. With 35% less calories and 65% more protein than normal Hemp Hearts (TM), the Hemp Hearts REDUCED FAT Powder™ is extremely satisfying and can be used to lose weight without any hunger. are highly nutritious meal replacement bars. Each bar contains 8 tablespoons (84 g) of pure Hemp Hearts™ (shelled hemp seeds), bound together with a small amount of dark chocolate and topped with whole nuts, dried berries or tropical fruits. There are 22 toppings to choose from. These are the most nutritious and best tasting natural protein and energy bars available. This new product is nothing more nor less than oil squeezed from Hemp Hearts (TM) – but containing the many very fine particles of Hemp Hearts that make it creamy. The taste is incredible… This product comes in 225 ml glass jars. Eighteen choices of SATISFYING hi-protein desserts. Each is 2oz (55g) of reduced fat Hemp Hearts Protein Flakes™, bonded with 1oz (25g) dark chocolate, topped with one choice of nut or dried fruit & maple syrup spray. For perfect taste, lift one corner of lid and heat in microwave for 50 seconds. 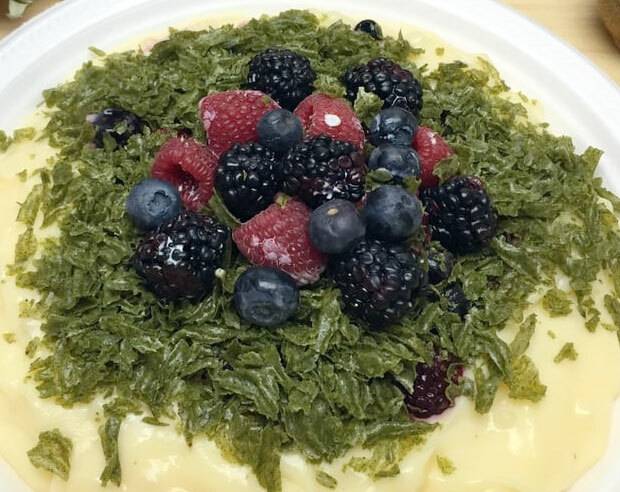 Serve with ice cream or yogurt.Because base has 2oz (30g) protein, each dessert will satisfy for 4 + hours…Some customers use two per day with ice cream or yogurt to lose weight… calling them WEIGHT LOSS DESSERTS. They notice that the protein provides the tissue health benefits. 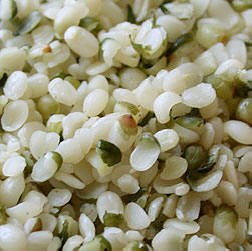 New Hemp Hearts™ product which is high in protein and gluten and sugar free! It’s sweetness comes from stevia, tiny amounts of maple syrup and tiny amounts of diabetic friendly mesquite flour (tree of life). It is gluten free – bonded with tiny amounts of cassava root (tapioca) and tiny amounts of diabetic friendly mesquite flour. 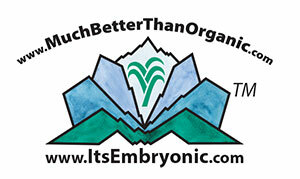 It’s high in protein – from Embryonic Hemp Hearts, Embryonic Hemp Hearts flakes, egg and mesquite flour (tree of life). Also contains butter, cinnamon, and baking powder. Allergy warning: Hemp Hearts products may contain tiny amounts of other grains; our chocolate contains some dairy, sugar, vanilla and soy emulsifier; our nuts, fruit & maple syrup are typical bulk store items. 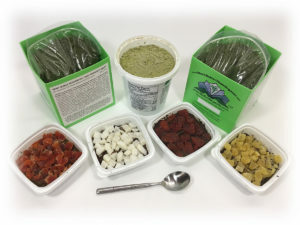 We invented Hemp Hearts TM and then learned how to use them with mountains of long fiber foods for their protein which then reverses an amazing spectrum of tissue health problems. (Large portions of our society are protein deficient) When they are used in this manner they also lubricate the passage of rope-like wastes (the remains of the long fiber foods) and thus ensure perfect digestive health. We then sent millions of instruction booklets with hundreds of thousands of cases of Hemp Hearts TM –all at no charge– to health care professionals all over the World. This program worked perfectly and the name Hemp Hearts TM became associated with health. 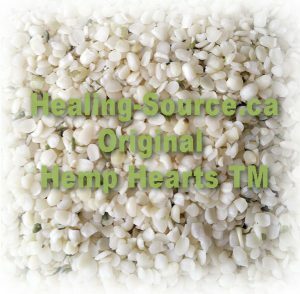 Now that we have rebuilt our facility we again have the best quality Hemp Heart in the World. Ours are virtually free of shells and always have a wonderful sweet taste. They are light colored, large halves. To benefit with Hemp Hearts TM, people must change their diets totally in order to use them in sufficient quantity for the protein that is always necessary to experience health benefits. 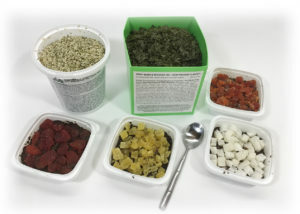 A minimal 5 tablespoon daily serving of Hemp Hearts TM is only the protein equivalent of one US quart of milk, but to use even that limited amount successfully individuals must replace the starches and processed foods in their diets with long fiber foods, especially raw vegetables–or they may poop their pants in their cars. For those who really need assistance with tissue health issues, we recommend 8 tablespoons of Hemp Hearts™ mornings—always with a mountain of long fiber foods. 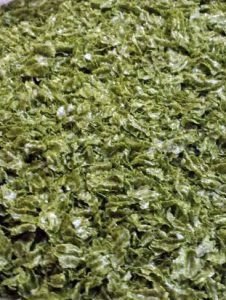 I have now removed some of the oil from Hemp Hearts™ to make two delightful, pure hemp products: Hemp Hearts (REDUCED FAT) Flakes™ and Hemp Hearts (REDUCED FAT) Powder™. 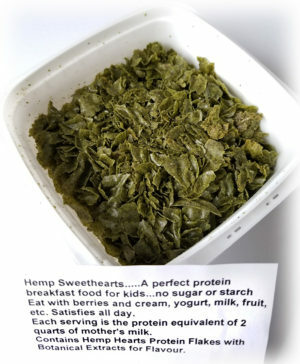 They are each over fifty percent protein, but they each only contain about one quarter the fat of Hemp Hearts TM. They are much lower in calories, much less lubricating of the digestive system and therefore much easier to use with any other foods for the protein that is by far our most important nutrient – essential for all real health benefits. It is quite convenient to use my Hemp Hearts (REDUCED FAT) Flakes and Powder to obtain the protein equivalent of more than one US gallon of milk per day. 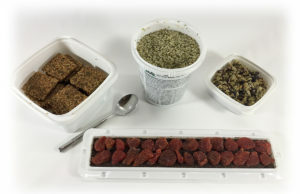 To control or lose weight, people can eat Hemp Hearts (REDUCED FAT ) Flakes TM for breakfast with yogurt or fruit or chili or cereal—any small meal—and then again later, experiencing no hunger each day at all, but consuming so few calories that weight control or loss is inevitable ……all while utilizing the amazing protein for improved tissue health. Hemp Hearts (REDUCED FAT ) Powder™ is great with smoothies, soups, as a latté, or with any drink. We have no competitors for our Hemp Hearts (REDUCED FAT ) Flakes™ and it is not likely that there will ever be any. All of our competitors are primarily interested in maximizing their profits by selling products made with ground shells–products made worthless with prices and recommendations that ensure that they are only used in symbolic quantities. Our Hemp Hearts (REDUCED FAT ) Powder™ is the ONLY hemp protein powder that is not sandy and bitter with ground shell particles. In fact, we make 30 premium products from Hemp Hearts—but nothing at all that includes bitter, sandy, ground shell material. Organic Hemp Protein Powder– because of its sandy ground shell content–normally tests with 2000 percent more air pollutants than our shell free Hemp Hearts™ products. 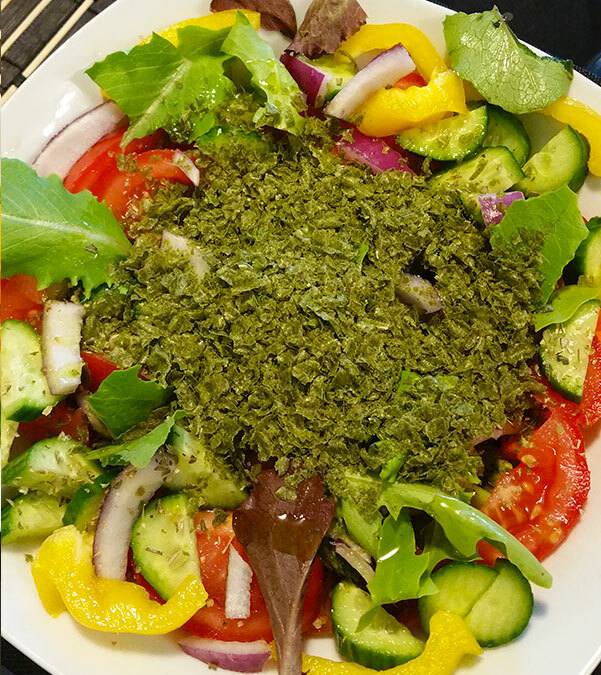 Nutritious vegetable salad with Hemp Hearts (REDUCED FAT) Flakes™ as protein source…. 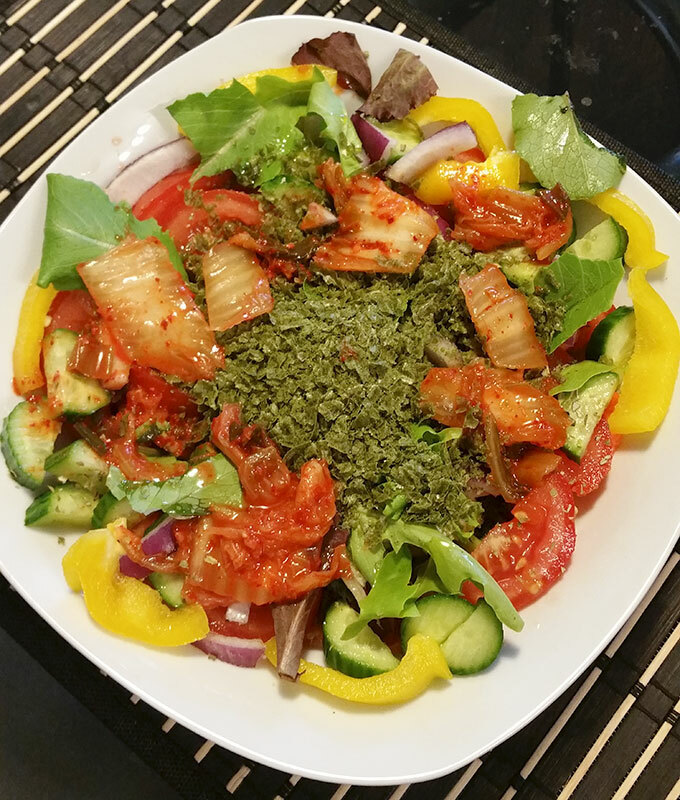 Carrot, celery stick, cucumber, tomato, pepper, asparagus, red onion, sunflower seeds, pumpkin seed, Hemp flakes…. is 225 ml of freshly squeezed hemp oil in a 250 ml jar. About 1/3 of it consists of fine particles of Hemp Hearts (TM). It is certainly the best tasting oil on this Planet and the only one containing protein. 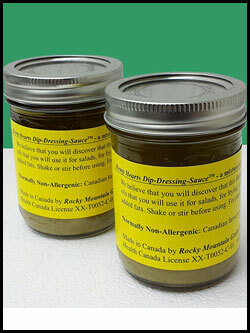 Hemp Hearts Dip-Dressing-Sauce™ can be used alone as a dip, a salad-dressing, a wok-cooking sauce, a frying-pan sauce, a meat-roasting sauce, a stuffing-sauce or a base for any of the above. If you add the following flavor ingredients to each jar, you can make some of the best traditional dips, dressings and sauces ever experienced. If you store it frozen you can use it directly from the freezer. It will never be harmful, but the taste will change after several months if it is not stored cold. I have been selling what is technically the best omega oil on the planet for fifteen years–mine. No human has ever experienced significant health benefit from my oil products–except for reduction of eczema and psoriasis— tissue health issues that are also reversed with my protein products. If you want to better understand how we have all been manipulated to varying degrees by unscrupulous promoters of foods, supplements and medications—read, Fear of Food, University of Chicago Press by Harvey Levenstein. 2012 . Levenstein is a professional historian who has meticulously tracked many of our food beliefs back to their fraudulent historical sources. You might be shocked at much of the detail presented—all properly footnoted so that you can check his facts—detail which proves, absolutely, that virtually everything “known” about food—especially about oil– is junk science. Although Hemp Hearts™ are about 50 percent fat, the fat is intrinsic to the tiny half seeds, protected by cell membranes. It is not all released in the stomach, so some of it serves to lubricate the small intestine, the large intestine and the colon. 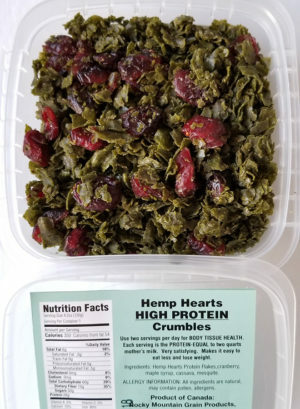 When Hemp Hearts™ are used with large quantities of long fiber foods (raw fruit and vegetables that have not been in a blender) there is no such thing as constipation. Every digestive system cleans out perfectly. Those who consume at least five tablespoons of Hemp Hearts™ with long fiber foods every morning also notice that the additional protein—the protein equivalent of one quart of mothers’ milk– rewards them with some tissue health benefits. Those who use more than five tablespoons ofHemp Hearts™ each day experience more tissue health benefit—but normally have to replace all starch and all processed food items in their diets with long fiber foods—to avoid unpredictable bowel movements. My experiences with many tens of thousands ofHemp Hearts™ customers led me to invent machinery to remove some of the fat fromHemp Hearts™ —-to make Hemp Hearts (REDUCED FAT) Flakes™ and Hemp Hearts (REDUCED FAT) Powder™ . They can easily be used twice each day to supply customers with the protein equivalent of one gallon of mothers’ milk per day—without the excess calories and excess lubrication inherent in the 50 percent fat ofHemp Hearts™ . Everyone with imperfect digestive health should begin with enough Hemp Hearts (TM) and enough Long Fiber Foods to establish perfect digestive health. 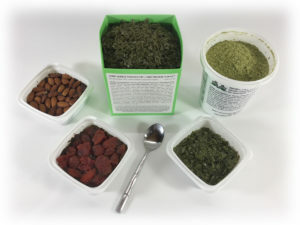 When wastes are like soft ropes and individuals feel empty after expelling wastes each day, they can replace most of the Hemp Hearts (TM) in their diet with twice as much Hemp Hearts (REDUCED FAT) Flakes (TM) and / or Hemp Hearts (REDUCED FAT) Powder (TM) to reduce calories for weight control and to increase protein for better tissue health. Don’t set yourself up to be victimized. Beware of those who copy our products and then even steal our product names from us. They usually pretend to add flavor and/or pixie dust to a poor quality products so they can become rich by marketing magic to those who do not know better— but who are desperate for help. No actual hemp oil has any effect on cancer or on any other health problems—with the exception of psoriasis and eczema. My hemp protein products are useful for those who desire to maintain healthy bodies or to rebuild their bodies both before and after invasive treatments . My hemp protein products are very helpful—not because they are medicine—but because they are protein. Every cell in the human body needs protein to be healthy. Those who contemplate invasive, tissue destroying, cancer treatments will benefit by using my hemp protein products in large quantity. Protein is always essential to develop healthy tissues– both before and after treatment. by slowly evaporating the poisonous alcohol away from the remaining tar-like medicine. (D) More Than 20 Meal Replacement bars That Are SimplyHemp Hearts™ Topped With Fruit or Nuts—— More Than A Square Meals™: We make more than twenty huge and unique Meal bars—each 2 inches wide by 12 inches long and each with a base of 8 tablespoons of Hemp HeartsTM stuck together with minimum German chocolate then topped with amazing quantities (24 square inches) of large nuts, berries or chunks of dried fruit–no starchy fillers. 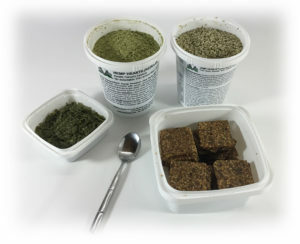 Because of the large quantity ofHemp Hearts™ used, each Meal bar commonly replaces 2 meals. Apricot, plum, fig and date Meal bars may have as many as 18 whole dried fruit items on top of each base. Berry and Nut Meal bars commonly have over 60 whole nuts or 110 whole dried berries as topping. Each of our Meal bars actually consists of about 90g Hemp Hearts TM and 90g of nut or fruit topping stuck together with about 40g of chocolate in which there is about 8g of sugar. The evil sugar added to the chocolate in each bar therefore is about 8/220 or 3.6 percent of the weight of the entire bar—about half the percentage of the same evil sugar found naturally in carrots or sweet peas. 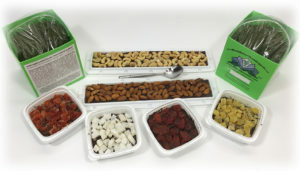 Dairy Free More Than A Square Meal™ units include topping choices: Roasted Almond, Roasted Cashew, Pecan, Brazil Nut, Macadamia Nut, Blueberry, Cranberry, Strawberry, Coconut, Prune, Raisin, Papaya, Pineapple or Pine Nut. 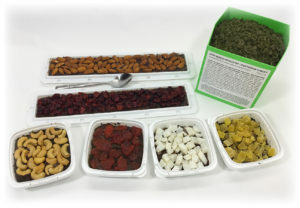 Milk Chocolate More Than A Square Meal™ units include topping choices: Hazel Nut, Walnut, Apricot, Cherry, Date, Fig, Gogi Berry, and Mango. The best choices are not the last mentioned in each group. (E) Two Unique Hemp Oils Made From Hemp Hearts™ ——Hemp Hearts Clear Hemp Cooking and Salad Oil™ and Hemp Hearts Green Hemp Cooking and Salad Oil™ : We also have two types of cold pressed hemp oil made fromHemp Hearts™ —one green with hemp flavor, Green Hemp Cooking and Salad Oil™ and—one clear with nutty taste, Clear Hemp Cooking and Salad Oil™. They are the cleanest and most stable health food oils on the market. We provide a German University Study that proves that they can be used for cooking without any damage to their omega properties–without any formation of trans fats. With our Hemp Hearts Dip-Dressing-Sauce™ above they are the only hemp oils on the Planet made from the internal parts of the hemp seed—thus avoiding the immense amounts of air pollution commonly found on shells and contaminating competitors’ hemp products. Lab tests reveal that our products made from our Hemp Hearts have 2000 percent less air pollution than competitors’ organic products. But supplements are worthless: Everyone requires sufficient milk-equivalent protein to develop and maintain perfectly healthy tissues that will resist disease. Everyone also requires sufficient long fiber food–raw vegetable matter that has not been cooked or ground in a blender–so their poops will be like ropes, not toothpaste or marbles. Those who consume sufficient protein with sufficient long fiber foods will develop and maintain appropriate microorganisms in their digestive tract. Almost everyone in this society has unhealthy tissues and poor resistance to disease because they are deficient in protein. I suggest 55g of my Flakes and/or Powder twice each day to restore tissue health quickly….the equivalent of 4 liters (one US gallon) of mother’s milk. If customers learned to select suppliers in inverse proportion to the number of rented “brand logos” with which they adorn their packages—then the creeps in the food industry would disappear. I suggest you should avoid purchasing anything from those who make any of the following non scientifically verifiable claims: LOCAL, ORGANIC, NATURAL, FAIR TRADE, WINDMILL POWERED, VERTICALLY INTEGRATED, FARMER OWNED, KOSHER, HALAL, GLUTEN FREE, GOVERNMENT APPROVED, SULFUR FREE, HYPO-ALLERGENIC, etc. Anyone who desires to market Halal meat products, merely has to claim that a prayer cassette was played for the creatures… as they died. For the price of a single cassette tape from any Moslem Association, anyone can legally use the Halal Brand on any meat product—but why bother, who is checking. The others brand logos are no different. They are rented for marketing purposes.